Oil decoloring process, oil decoloring method are many, the most widely used in industrial production is the adsorption decolorization method.In addition to heating decoloring, oxidation decoloration, chemical reagent decolorization method, etc.In fact, in the process of oil refining, oil removal of pigment in doesn’t rely entirely on decoloring section, the alkali refining, such as acid refining, hydrogenation, deodorization section has auxiliary decolorization effect. Adsorption decolorization, oil adsorption decolorizing, is to use some of pigment has strong selective adsorption material (such as bleaching earth, active white earth, activated carbon, etc. 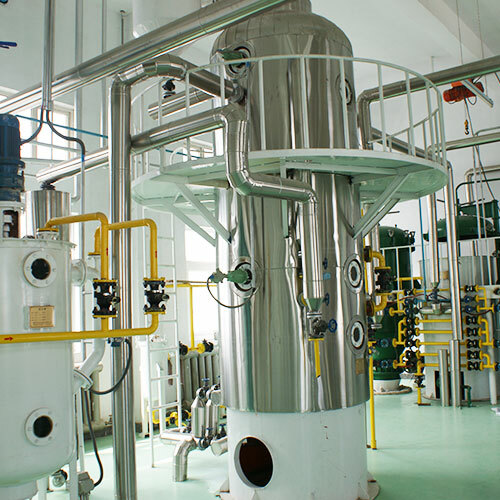 ), under certain conditions the adsorption oil pigments and other impurities, so as to achieve the aim of decoloring.Through adsorbent processing oil, not only to improve the oil color, the purpose of removing pectin, but also can effectively removal of trace metal ions, and some can cause some hydrogenation catalyst poisoning substance, thus for further refining of oils and fats (hydrogenated, deodorization) provide a good condition. Intermittent decoloring oil and adsorbent in intermittent state through an adsorption equilibrium and the process of complete decoloring process. The conventional bleaching process, the reservoir into the oil in the decolorization of decoloring tank, heating drying under vacuum, and the adsorbent can inhale the adsorbent under stirring fully contact, complete the adsorption equilibrium, then the cooling by pump pumping pressure filter separation of adsorbent.After filtration decoloring oil into the reservoir, borrow or oil transfer pump into the deodorization process, vacuum suction filter press in the adsorbent filter cake into the processing tank recovery of residual oil. Pipeline continuous decoloring process: this process is to maintain stable conditions, to ensure consistent product quality a modern decoloring process.By using the process, acid oil pump input, after the flow meter to adjust to the process flow into the harmonic tank, by the impact of the circulation flow, mixed with quantitative proportionmeter adsorbent fully, and then by pump through a preheater preheated to a certain temperature, drying into the dryer deoxidization, again by the heater to heat pump to the decoloring temperature into the reactor after complete the adsorption equilibrium, then the cooler to filter the temperature, the pump is pumping filter separation of adsorbent.